The airport at Ayers Rock (Uluru) commemorates Central Australian pioneer aviators. Ayers Rock Airport also known as Connellan Airport was originally started by Edward Connellan. He started an airline called "Connellan Airways" which specialised in transport, Royal Flying Doctor Service and mail runs. The development of tourism infrastructure adjacent to the base of Uluru that began in the 1950s soon produced adverse environmental impacts. It was decided in the early 1970s to remove all accommodation-related tourist facilities and re-establish them outside the park. In 1975, a reservation of 104 square kilometres of land beyond the park's northern boundary, 15 kilometres from Uluru, was approved for the development of a tourist facility and an associated airport, to be known as Yulara. The new facilities became fully operational in late 1984. RT. HON. MALCOLM FRASER, C.H., M.P. 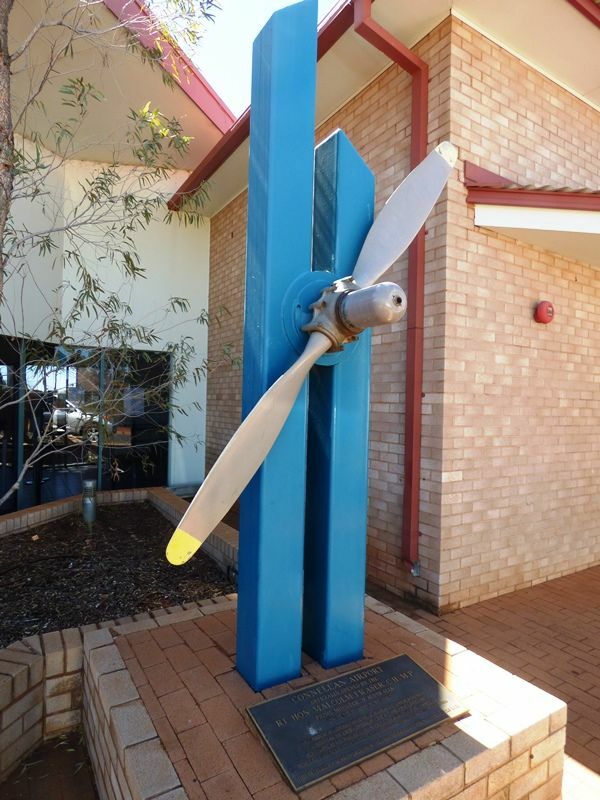 This Airport Is Dedicated To Central Australia`s Pioneer Aviators In Particular, Mr. Eddie Connellan C.B.E., A.O. Who First Landed His Aeroplane At The Base Of Ayers Rock On The 7th August, 1938. He Commenced Regular Passenger Services From Alice Springs To Ayers Rock On 20th April 1958. This Propellor Was Recovered From The First De Havilland Heron To Fly To Ayers Rock.